It was December 2016. I was in the Ecuadorean Andes staying at a mountain lodge at about 10,500 feet (3200 meters) above sea level, and only a few degrees from 0 latitude (the Equator). The mountain air was clean, lean, and crisp. The world had just witnessed an absolute lunatic win the most powerful seat in the world. I was still reeling from that shock (like millions of people) and desperately wanted to clean out my head in the hope of getting a grip on reality. How was I going to do that? I had no idea! The plan was to leave behind the world of my daily life and lose myself in the lofty mountains and valleys in the middle of the world. The lodge I was staying at, happened to be just the right place for this. It was surrounded on all sides by mountains and lush valleys. I could wake up and choose one of the many trails that went by the lodge and venture into any valley or mountain I wished for. The possibilities were many, and I was ready to surrender myself to the Andes. I had disconnected myself from the news, social media, emails, and other such usual trappings. Not out of choice, but just because of the non-availability of the ubiquitous wi-fi. It was just what I needed. So the ritual was set – every morning, wake up before sunrise and after breakfast, go about exploring the trails, return by sundown, with a full heart, a brain just slightly emptier than the previous day, and two failing legs. After a shower and a quick nap in the cabin, head to the communal dining area in the main hut of the lodge. Other fellow travelers would join, pleasantries would be exchanged, each of us would tell their tale of the day’s adventures over glasses of wine and the cozy warmth of the wood fired stove. Delicious hot food would arrive and everyone would eat to their heart’s content. After a satisfying meal, all of us would retire to their respective huts. Wake up at the crack of dawn (the rooster at the lodge was punctual to a fault) and repeat it all over again. It was all a little too blissful. Before any of the Americans at the table could speak, C said in his gentle manner “I have a request, I would greatly appreciate if we do not talk politics at the dinner table. Thank you.” His manner was polite and it was impossible to counter his request. Everyone respected his wish and the conversation drifted to other topics: from the conditions in Venezuela, to the Galapagos, and the activities that each of us had planned for the following day. After dinner and a game of bananagram we retired for the night. The next morning, I decided to take a tour of a cheese factory established by some Swiss missionaries in the seventies in a nearby village. It was a 30 minutes ride from the lodge. About an hour’s drive away from the factory is a cloud forest and that seemed like just the kind of place I would want to spend an afternoon in. From the cloud forest the plan was to hike back to the lodge before sundown. After breakfast, as I was waiting for my ride, I saw B and C slowly walking towards me. They mentioned that they intend to also join me on the tour of the cheese factory and the cloud forest. I was happy to have company and off we went in the pick up truck, them riding with the driver and me in the open area of the truck in the back. At the factory, B and C relied on me to translate everything the cheese makers were talking about the history of the factory and the process of making the cheese. It was a challenge, but I think I managed to convey the gist of whatever I could understand with my elementary knowledge of Spanish. After tasting some cheeses (in all honesty, I didn’t quite like any), we headed for the nearby cloud forest in the pick up truck. The plan was to take a short walk in the forest while learning about the various plant species. While walking in the forest, I was accosting C since the trail was quite moist and slippery and he seemed to need some support on steep or slippery surfaces. On our walk C narrated to me stories from his past travels. I learned that him and B were well-traveled – Croatia, New Zealand, Tasmania, Burma, Lebanon, etc. I could figure out that he had a genuine appreciation of the cultures and people of various places. Never for once was there even a hint of prejudice or malice in his stories. After walking for a while, B and C said that they would like to go back to the lodge in the truck. I bid them off and promised to see them at the dinner table that night. Off I went into another valley to further empty my brain out. At dinner that night, C was sitting right next to me. He inquired about my hike. B was sitting across from me and casually asked me where I lived in the United States. I said, DC. To which C asked “Where in DC?”. By now, I wasn’t sure where this was going, but proceeded anyway to describe the geography of the neighborhood in the context of some major landmarks of the city, like the US Capitol. After a bit of that, I narrowed in on the few blocks of Capitol Hill where I reside. “By the Northeast side of Lincoln Park on Constitution Ave”. I said. B said with a hint of excitement “Oh, we used to live right there on 11th and East Capitol Streets”. That hit me like an Alpaca had kicked me in my chest. I felt like a complete idiot for explaining them the geography of Capitol Hill, about 90 seconds ago. I wanted to be invisible. By now, the rest of our fellow travelers had stopped talking among themselves and were listening on to our conversation. Both of them fell silent for a few seconds. I immediately realized I had asked a question that wasn’t something they were willing to answer. But now it was out there, and the rest of the diners were also looking at them in anticipation of an answer. This is now the second time in a matter of seconds that I felt like a complete moron. More Malbec to dull the shame. With that he asked Edmundo (the inn keeper) to replenish the wine on the table, as if anticipating that I may ask for more such questions which will require me to gulp down my over-eagerness in knowing other’s people’s business. It was going to be a long night. Everyone’s faces had lit up. A thousand questions were churning through our collective brains, 950 of which were in my brain alone. I did not know where to begin. Very naively (in hindsight now), I felt like I could get all the answers to all that had happened in the last few weeks from C. Before I could begin my line of questioning, C started to talk (thankfully, since I would have most certainly made a fool of myself, thus scoring a hat-trick, which, isn’t unusual for me). C talked about the months leading up to the elections, about his role in her campaign in Michigan (his home state). He talked about the Democratic primaries, the general mood during the primaries and then after her nomination was sealed. Of course, he divulged as much as he could without being unnecessarily salacious. There was a great amount of dignity in his speech, he never bad-mouthed anyone. We were all listening intently while sipping on the wine (Argentina had made way to Chile by now). After about 30 minutes C stopped, and there was an eerie silence in the dining room, save for the crackling sound of the burning wood from the fireplace. Needless to say, C didn’t have answers to any of my questions, but only his perspective on things. It was not enough for my greedy heart, not that night. So I asked C, “Mr. Senator, what do you tell fools like me? What should we do now?”. There, that was enough, enough for my heart that night and every night since that night. My brain had emptied out of the chaos and was a lot more clearer. What C said wasn’t new. I knew it all along, but just needed to be reminded. And that night, there in the middle (mitad) of (del) the world (mundo), with the two hemispheres on either side of me, I felt like my brain had emptied out of the hopelessness and filled with a new vigor. A forgotten song from a forgotten film of the 80s. Hip Hip Hurray was Prakash Jha’s directorial debut, and as far as I remember, it is probably the first Hindi film of the sports genre. I remember this movie making an impact on me when I first watched it on Doordarshan in the 80s, but a recent revisit to the film, showed that it does not stand the test of time and feels jaded. This song which comes on very early in the movie, sets the tone for the lead character of the movie, Sandeep, played by an equally forgotten actor of the 80s, Raj Kiran. The music is by Vanraj Bhatia, who was primarily known for his tunes for art house films, TV shows, and ad jingles. If you listen to the first two lines of the song, you can imagine it being used for a TV ad for either Bournvita or running shoes or anything that gets you going in the morning. The song is in first person, where the person is having a conversation with his life as if it were a separate physical entity. Gulzar has used this figure of speech personification in another song on life from Sadma – “Aye zindagi gale laga le“. For someone who is listening to this song for the first time, the first line – Ek subah ek modpar, maine kaha use rok kar (one morning by the bend of a road, I stopped her and said to her) – does not indicate, who is it that the singer is addressing. You may think, it’s probably his lover, but then in the second line we get the reveal that he is talking about his life – haath badha aye zindagi, aankh milakar baat kar (give me your hand my life, look into my eyes and talk to me). I find this construct of using a pronoun before the proper noun very alluring, very mysterious. There is such fragile beauty and hopefulness in these lines – of renewal, of everyday being a new journey, of every setback being just a mile marker in a long string of journeys! With this realistic optimism the second stanza dives into the nature of his intimate relationship with his life. This is where he is accepting his life as his twin, as his companion, as two people who are witnessing each other’s ebbs and flows, ups and downs, being there for each other when things get difficult – he is the morning (hope/renewal) to her evening (despair/sadness) or vice-versa! This song very neatly summarizes my state of mind. In the recent past, I found myself in a familiar melancholic mood, caused by a deep angst and quest of knowing the purpose of me and my life (cliched, you may say, but it’s something I live with every waking moment). I usually know how to deal with this state of my being, but this time around the spell lasted for a long time. It had become difficult to be around people, and I am assuming people found me quite difficult to be with. Luckily, I was fortunate enough to spend a week away from everything and everyone in isolation in the midst of a primary jungle. It was just what me and life needed. Us twins were able to talk to each other while walking for hours on the forest floor from day break (subah) to dusk (shaam) and even at night (raat). Making my way through the dense forest by hacking away vines and thorny bushes with a machete through vegetation so dense, you couldn’t tell whether it was evening or afternoon. Metaphorically, this helped me navigate through the webs inside of me. I am not saying, I found my purpose and the purpose of my twin, but it helped me reconcile with her, to be with her, to be a witness to each other’s existence. However inconsequential and pointless we may seem to each other, it was good to acknowledge each other’s presence, and for now that’s enough. NASA’s voyager has sent many awe-inspiring pictures of the universe, the cosmos, the planets. 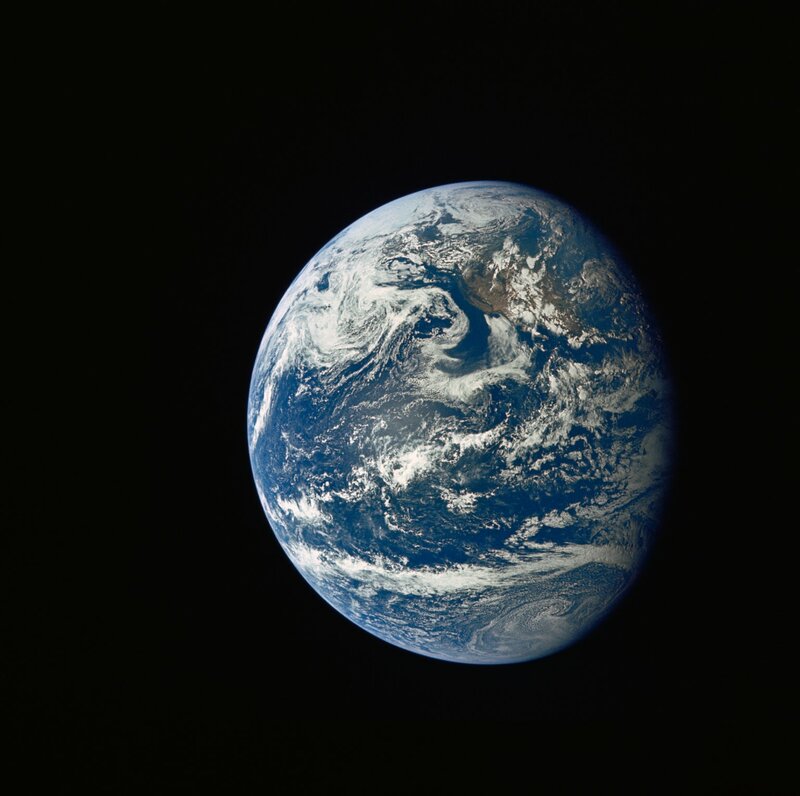 One of the many pictures sent by Voyager shows our planet from about 6 billion kilometers. 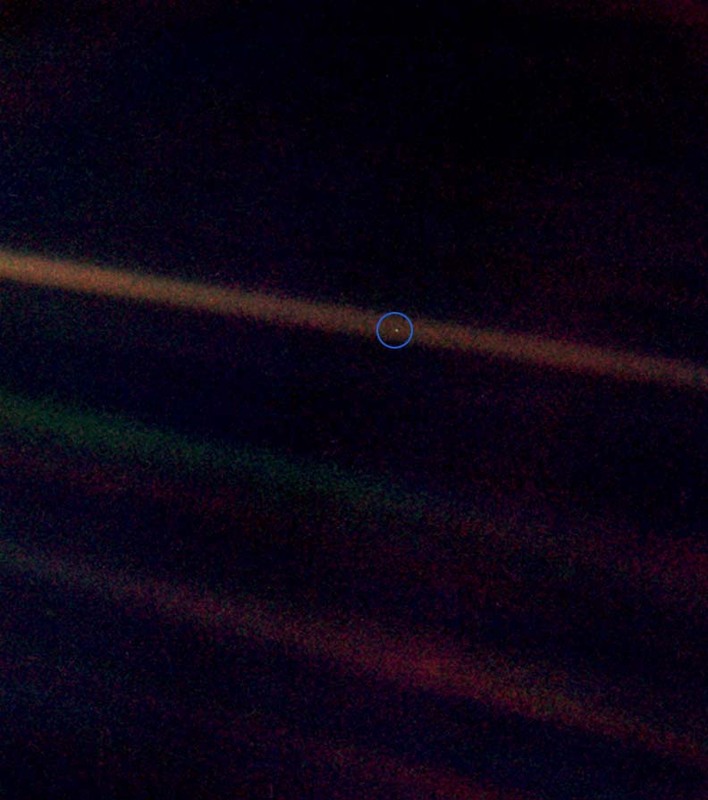 From that distance, the Earth appears no more than a speck of dust, a mere “Pale Blue Dot”. The words in bold above are not part of the original excerpt, Sagan did not call these words out, the bold typeface is my embellishment. I have been mulling over thoughts that are quite similar to the ones expressed in these words for over a year now. I have been grappling to come to terms with the reality of my “being” my “existence” and the ridiculously microscopic inconsequential aspect of it. Yes, a bit of a self-absorbed line of thought you can say while alluding to the “…our imagined self-importance…” line from Sagan’s writing above. I believe, there is some meaning to us being here…I am not talking from a spiritual or a divine point of view – for the record – I am an atheist – not an agnostic – an ATHEIST. So my quest for this is purely scientific, purely factual. I want to believe that my being matters, my doing things matter, my not doing things matter, my existence has some meaning – it is an essential piece in the completion of a mathematical or an astronomical theorem. Without me there will be a me shaped void, something will be incomplete – like how a small deformity in one of the legs of a chair makes it wobbly, like how a dash of salt completes a dish, like how one missing note can render a melody incomplete! Tolerance – Is there another word that has such self-importance and patronizing tone built into it? It suggests, nay, declares that the one who is doing the “tolerance” is being generous to the one towards which this “tolerance” is aimed at. There is a word “Upkaar” in Hindi or “Ehsaan” in Urdu, which loosely translates to “favor” or “benefaction” in English. For me, “tolerance” is loaded with “upkaar/ehsaan”! So when someone (or some society/nation/organization) says “I am tolerant of all races/religions/nationalities/sexual orientations, etc.”, I smell self-righteousness in their claim of “tolerance”. For true equality, there shouldn’t be a need for any tolerating, there should just be “acceptance” of “you are who you are”. Pain – It’s not new news that a majority of the great artists from around the world, from the past or the present, were people who harbored great pain. Whether it be pain due to difficult childhoods or unrequited loves or substance abuse or personality disorders or financial issues or abusive parents or conflicts (war/ideological conflicts/persecution), each one of them were troubled in their own way. This pain translated into some of the greatest pieces of art – music, paintings, sculptures, films, performances, books, poems, etc. There seems to be a direct correlation between creativity and the degree of pain the creator is experiencing. So by deduction, great art is borne from great pain. As I said, not new news! What intrigues me is – do the artist’s have a predilection to continue to nurture this pain, not let go of it, to seek out even more pain, in order to keep their creativity alive ? Do they consciously not want to heal their pain or attempt to alleviate it? Is pain their addiction, do they really enjoy pain, do they even crave it ? Lately, I have been doing some self-evaluation and introspection, what I have noticed is that I have been the most lucid in my writing when I am in a place of emotional turmoil/pain. Once I am in this state, I see things more clearly, I feel energized to exercise my creative side while all other parts of my biology want to shut down – sleeplessness, restlessness, snappy behavior with close relations, and a general lack of focus at everyday tasks – such as my job, household chores, socializing, etc. During this period, I feel like two different people are inside of me – one, which feels like it’s drowning and sinking into an abyss and another – who is charged up to “create” something. It’s an extremely confusing and exhausting period, but what I am coming to understand is that maybe, just maybe, there is a chance I actually enjoy being in this state. If this is true, does it also mean that I have an affinity to pain? And does it make my actions that cause this pain, masochistic? Been 14,600 days, today. Can’t say how many more! Important thing is to make the most of the remaining todays, looking forward to make them somewhat relevant before there is no more “today”. Until then, want to keep this hopeless optimist heart, loving and living, more importantly – Loving and Living with no receipts! Predictably, borrowing Gulzar’s words to express my constitution today! The year was 1985, a time when one of the most exciting things about the week was the screening of a Hindi movie on Sunday evenings on the state owned (and the only) television channel Doordarshan (DD). Everyone in my household would finish their chores and be ready for the 6 PM start of whatever movie was chosen by the overlords at DD. One such Sunday evening, our Black & White Dyanora television showed us a movie called Choti si baat. Of course, these were the days of no internet, and hence no ready access to information on the movie one was about to watch – unlike current times when you get to tune yourself before watching any movie – you know the cast, you know the genre, you know the reviews, the IMDB/tomatometer ratings, etc. As a 10 year old in 1985, I had no such baggage. The only thing I would be interested in a movie was what we kids called “dhishoom-dhishoom” – aka action scenes – stunts, car chases, gun fights, sword fights, galloping horses, sword fights or gun fights on galloping horses – you get the idea. Due to the previously mentioned lack of the internet, there was no way of knowing whether the movie I was about to watch fed to this violent appetite of mine. However, I had figured out a way of finding out whether the said movie may have any of the dhishoom-dhishoom, I so eagerly wanted to see – I had figured out that if the opening credits showed “Action” or “Stunt coordinator”, there was a good chance that I will be a happy camper by the end of the movie. And if the credits did not mention these, well, it was time to find something else to do. 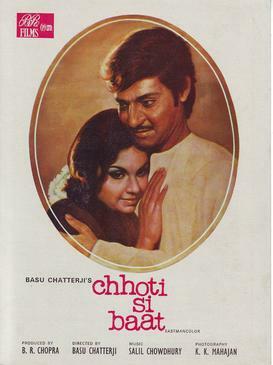 After watching the credits of Choti si baat, it was quite clear that there won’t be any action – moreover one look at this Amol Palekar chap (the “hero” of the movie) and I knew it was a hopeless pursuit. see the greenery outside, table fans were hung from the walls, a clumsy looking menu board could be seen in the background, the tables were too close to each other – overall, it was all very “non-filmy”. I distinctly remember, the 10 year old me wanting to go there and eat whatever the characters in the movie were eating. Years went by, and as I started to get interested in music and movies, I happened to stumble upon Choti si baat once again in my college years. I must say this might be the first movie of the romantic-comedy genre that I enjoyed entirely – for its grounded characters, for its easy humor, for the wonderful lightweight performances by Amol Palekar, Asrani & Ashok Kumar, for its wonderful music (especially – Lata’s soulful Na jaane kyon and Yesudas and Asha’s lovely duet Jaaneman Jaaneman) and most importantly for its nonchalant depiction of realism by it’s director – Basu Chatterjee. The realism of his rom-com movies is unlike the ones from the rom-com movies of this decade, where the realism seems to be deliberate and created out of meticulous production design. Examples: Wake Up Sid, Life in a Metro, Band Baaja Baraat, etc. Seeing the restaurant scenes again, brought back memories of 1985, brought back that longing of going to that restaurant. This time around, I paid attention and the Asrani character says the name of the restaurant “Cafe Samovar”. I had no idea what Samovar meant, but the name somehow just sounded so perfect for that place. Years passed, and every once in a while whenever a Choti si baat song would hit my ear drums, I would think of Cafe Samovar and the desire to go there would be awakened. I lie not when I say, I could literally picture myself in that place. I googled the place and found out that it’s in the Kala Ghoda neighborhood of Bombay inside the same building as the Jehangir Art Gallery. Knowing where it was, made my desire of visiting Samovar even more stronger. It was just a happy coincidence when I found out that A loves Choti si baat too and would also love to go to Cafe Samovar someday. 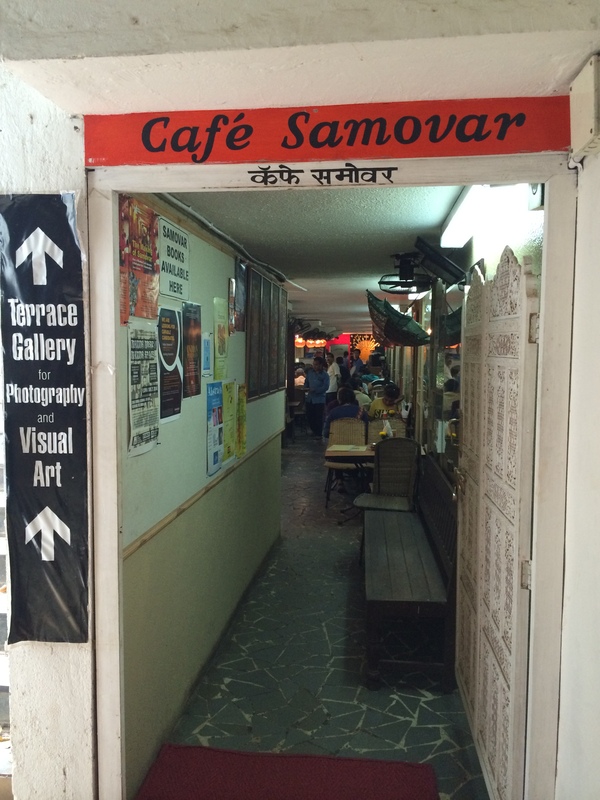 I have visited Bombay numerous times over the past 20 years, sometimes staying there for weeks, but never acted upon the desire to visit Cafe Samovar. Until one sweltering muggy day in June of 2014 when me along with A, my brother, his wife, and his son found ourselves in Bombay. Come hell or high water, I had set my heart upon having lunch at Cafe Samovar that day. After a bit of wandering around looking for the gallery and getting drenched with copious amounts of sweat in the process, we found it and made our way to the cafe which is tucked away in the right corner of the lobby of the building. We saw the sign of the cafe on its narrow doorway and as soon as we entered the restaurant I had a sense of being transported back almost 29 years after I had first laid my eyes on this place on the black & white screen of our telly. When one anticipates and desires something for a long time, the actual event, or the place, or the thing that one was looking forward to does not usually live up to ones expectations, leading to heartbreak and disappointment. This, however was not the case with Cafe Samovar, the moment I entered the narrow hallways, it was exactly how I had imagined it in my head for all these years. Sunlight was streaming in through bamboo curtains, tables were arranged too close to each other, there was non-pretentious art work hanging on its walls, there was a comforting hubbub of people, servers, conversations, whirring of the fans from the walls, clinking of silverware on ceramic plates, fragrance from parathas/chole/kheema wafting in the humid air – it was all too blissfully perfect. 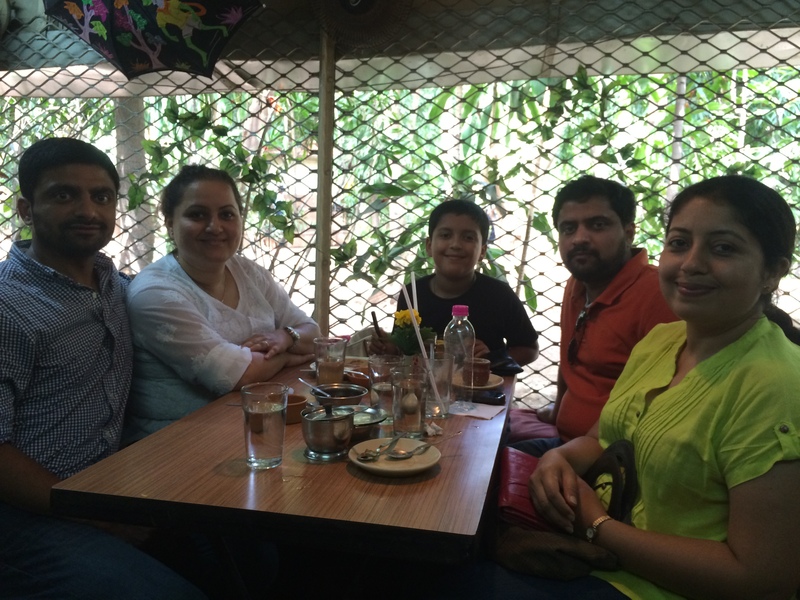 We settled into a table and ordered a plethora of things – I ordered what Nagesh ordered in Choti si baat – kheema paratha! We also had chole, dahi wada, neembu paani, lassi, egg curry, aloo paratha, etc. As the food arrived, we gobbled it up with much love and fervor. It was delicious, satisfying, and what can I say, but you had to be me to really feel how I was feeling! I was sitting there in Cafe Samovar lapping up every moment and I hear my name being called out from a table two rows from where we were sitting. Needless to say I was quite surprised and saw in the general direction of the sound to find an old friend from college beaming at me. 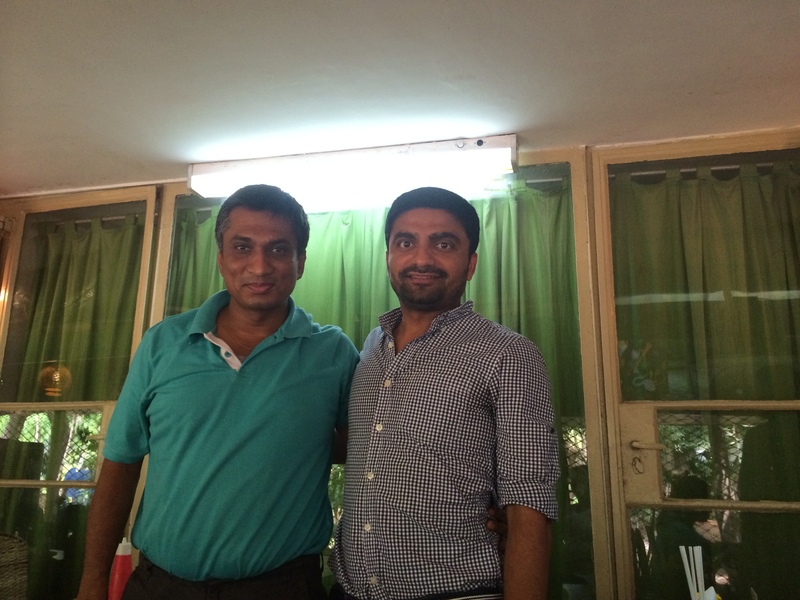 PB and I had not seen each other in over a decade, and it was quite pleasant to meet him. He was on a day trip to Bombay with his wife and they had decided to come to Samovar for lunch. Serendipity or Choti si baat, whatever it was, this added to the whole experience of Samovar. After catching up with PB, exchanging our phone numbers, and paying the bill, we left the cafe and browsed a bit in the art gallery. A few weeks back, I got a text on my phone from PB that Samovar has closed. There was a small cloud of sadness that followed me for some time, but it cleared off pretty soon, and was replaced by a feeling of contentment of having been there, and having experienced its “being”. I am not going to get in the matter of why it closed etc. Simply because, I do not want to know and will leave it to the fact that, it’s the way of the world and life – Old has to go to make way for new. We all keep the memories of places and people we love and are no longer around, inside of us. It’s a natural human condition. Although even before Samovar closed, I had brought one little relic of Samovar into Washington DC. I put Kheema Paratha on the menu of a cafe (Pansaari) run by a friend. A and I can frequently be found making and serving food at this cafe. Everytime I explain the food to the customers at Pansaari, I upsell the Kheema Paratha – and when they order it, I get a warm feeling. This is how I have managed to keep my Samovar alive. P.S: Writing this post has been a good reminder that what and who I love today, may not be around tomorrow. Loving them fully and unconditionally is the only way to keep them alive for as long as I am alive. With that, I resume another Gregorian year! Has this ever happened to you? You are traveling on a long distance international flight and are staring outside the aircraft window, planet Earth is slowly trundling under you and you see a stunning vista of a vast desert or snow-capped mountains or a little town in a verdant valley. You think to yourself – what place/what country is that? Then, you turn to the little screen in front of your seat and switch on the “flight info” channel to look at the location of your aircraft on the world map. You see that its Algeria or Kazakhstan or Austria because the screen shows the digital aircraft flying over a conveniently penciled-in world map with borders and names of the countries. You are pleased with the recently acquired knowledge and you shift your gaze back to the scenery outside the window. The point I am making (if it isn’t obvious), is that boundaries and nations are artificial and aren’t apparent when you look at the Earth from up above. Elementary, you think, and elementary it is. What I really want to say is that the creation of these artificial boundaries has led to the phenomenon of a) being attached to, b) identifying oneself, and c) subsequently taking pride in ones “nation”. This is commonly referred to as “nationalism”. It has been around as long as we have been marking the planet with “this nation” or “that kingdom”. I strongly believe that “nationalism” is an orthodox, divisive, and a regressive concept, an unnecessary by-product of the our race’s act of creating nations. You can very clearly draw parallels of nations and nationalistic beliefs to the creation of religions and religious beliefs. Both are equally divisive, equally unnecessary, and highly volatile when people from antagonistic beliefs (nationalistic or religious) get together. From early childhood, we are told, nay – we are indoctrinated to be “of a nation” and to be “proud” of being from our nation. While this may seem innocuous, it actually instills a false sense of pride that somehow my nation is better than any other. Those of us who grew up in India would remember the countless recitations of “saare jahaan se accha hindustan humara” and “hum sab bharatiya ek hai“. I find it quite ironical that we are taught a lesson of unity on the foundation of divisiveness – as in “we are united as Indians”- subtext being – we are not united with the rest of the human beings who belong to other nations . In my opinion, such nationalistic indoctrination is no different from religious indoctrination of children. Don’t get me wrong, teaching children their heritage, their culture, their arts, is one thing, but teaching them that theirs is the “best” or “better” than anyone else’s in the world, is what I take objection with. This may sound like a “mountain out of a mole hill” issue, but it won’t take you long to go through any history book of the world to understand how nationalism has been used (along with religion) to wage many wars. Of course, the extent to which one adheres to this nationalistic pride varies from person to person (just like how people vary on the scale of their religious beliefs/fanaticism). Regardless, of what the degree of ones nationalistic leaning is, it clouds the way we look at the world. Objectivity gets lost when pride takes over. I have seen seemingly open-minded, well-read, well-travelled people get agitated when they hear criticisms about their nation, regardless of how reasoned that criticism is. The roots of this irrational reaction can very well be traced to the early indoctrination of nationalism. Take this to an extreme and you can very well see how some individuals took (and continue to) full advantage of a mass hysteria of nationalism in their populations for their own egoistic conquests. Fanning nationalistic emotions are as easy as fueling religious sentiments and are time and again used by the ones in power for exercising control, wielding power, and vanquishing reasoned voices. I see it happening in my nation of birth (India) and my adopted nation (United States). ”अयं बन्धुरयं नेति गणना लघुचेतसाम् | उदारचरितानां तु वसुधैव कुटुम्बकम् || ”. Loosely translated as : This one is a relative, the other one is a stranger, these are traits of a narrow mind; for those with an open mind, nothing less than the entire earth makes up their family. I can only hope that this border-less idea of the world reaches critical mass in my lifetime and eventually all political and physical maps are rendered irrelevant. All we would be left is the natural and truthful beauty of a topographical map of the planet! Most of us have heard the old parable of the six blind men and an elephant. 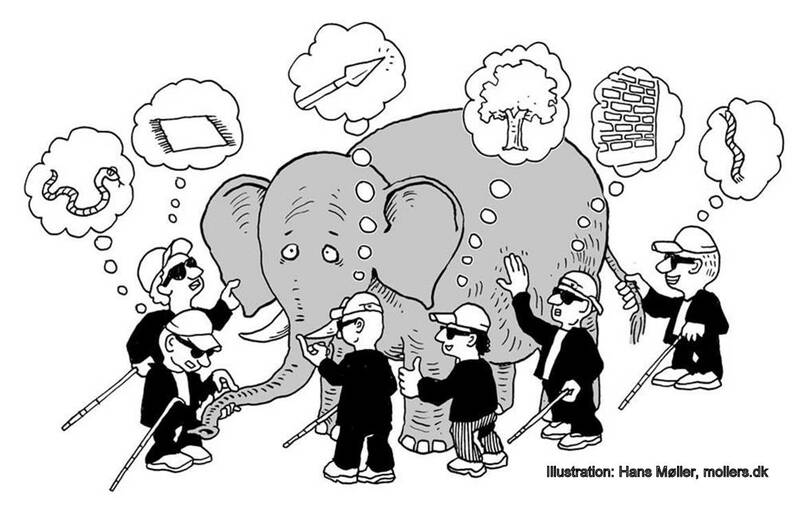 To summarize it briefly – Each blind man is asked to feel a different part of the elephant and describe the animal. Of course, each one describes it in a very different manner. The moral of the story being that the perception of a matter is highly subjective and it is imperative to know the entirety of the matter in order to arrive at a reasonably well-formed view, and thereby the “truth” of the matter. So why do I invoke this parable now? Recently, I have been surrounded by over 20 college interns (from various cultural/ethnic/economic backgrounds) who are helping out with a major event at our office. With a group of youngsters congregated in a small space, the environment becomes rife with many a colorful conversations. Given the proximity of my office from them, I get to hear every detail of these conversations. They range on all kinds of topics – Russia/Ukraine, Tinder, the missing 8-year-old girl who the city has been frantically searching for, which food trucks are the best, dating woes, hotness of a girl/guy, etc. While I enjoy this free entertainment, the number of times I heard them pass “judgmental” statements has startled me quite a bit. A few examples of these judgmental statements – “The Peruvian brothers truck has the best roast chicken….Yelpers are raving about it”, “Russia wants to bring back USSR”, etc. While these seem harmless, on listening the conversations a little more, these statements were from perceived information, information that they had not actively gathered and deducted but stumbled upon due to the very fact that this information is not only available in “excess” but is available with easy “access”. (The guy who said that Peruvian brothers’ food truck had the best chicken, had not eaten there himself!). When I pointed this out to the group, that they are passing judgments on things without collecting sufficient data (or first hand experiences where possible), I got quizzical looks from most of them. I admit, I must have come off a bit patronizing in my tone and very quickly, I realized that what I was saying was futile. This subject goes beyond the formation of “snap judgments”. There is a sense of entitlement in a lot of us, of having and standing by an opinion with little to no credible information to back it. In a world where such opinions can instantly be transmitted to thousands, it only adds to the perpetual vicious loop. This may not sound like such a huge issue, but it beckons to look 10 or 20 years from now. I do not have kids of my own, but I look at my friends’ kids who are in the 1-5 year age group and I imagine what their world would be like in such an environment. How will they form opinions? How will they pass judgments? What impact that may have on their lives and the lives of others they have influence on? Its one thing to coexist with a generation which did not have ready access to information and had to cautiously and painstakingly gather it (anyone over the age of 30 may fall in this category – but I have also seen many 30 somethings pass judgments purely on hearsay!) AND an entirely another thing where all of the humanity will be coming from a place where access to information is a mere finger flick (or a voice command) away – a finger flick where the odds of landing the wrong information are exponentially higher as newer information accumulates at an unfathomable rate. The last decade has seen this massive explosion of “excess” of information and easy “access” to information (or misinformation). The immediate effect of this is that we have to deal with the herculean task of perceiving the facts from this constant unstoppable flood of information (in corporate jargon – drinking from an open fire hydrant). It is all very overwhelming – for every point there is a counterpoint, for every fact there are a million myths. The result is that we give up on sifting through the mountains of data and exasperatingly form a snap judgment, not because we want to, but because it is the easy way out. Very soon, I see this tendency to arrive at a judgment become a habit (if it hasn’t already) for the current and future generations. I don’t know how to say it without sounding preachy, but the fact remains that this habit will create a toxic environment if we don’t exercise caution and educate our children about the merits of a procedural approach of arriving at reasoned opinions on matters – no matter how small or big the matter may be. The “snap judgment” phenomenon has become so commonplace that you don’t even notice it anymore. And I confess, I have been party to this myself more than I would like to admit. But, I do still have a part of my brain which keeps me in check and allows myself to retract my judgments and not repeat this behavior. On re-reading what I wrote above, the entire piece sounds pessimistic and preachy, which is hardly my intent or deliberate style. I still have faith in us as a people who have the ability to course correct ourselves. This trend of “snap judgments” may just be a side-effect of the Information Explosion phenomenon. And by saying this I also do not intend to make a villain of the Information Explosion. It is certainly one of the greatest inventions of the last 50 years. However, the rate at which it is evolving is what makes it unpredictable and cautions us that if we don’t orient ourselves and our future generations now, we may not have the luxury of time to course correct.It will be people walking around like computers – all “information” no “knowledge”. Our educational system, to an extent teaches us the benefits of data gathering, and data analysis prior to arriving at conclusions in the matters of academia. This however, does not translate too often to life situations – where we soak up information from the first convenient chunk of data we can lay our eyes/ears/hands on and just run with whatever suits our thinking. If I had children of my own, I would narrate the six blind men story over and over to them – and not just for their benefit, but mine too, since it’s so easy to get carried away in the strong currents of the flood of information around me. The merits of the moral of this parable cannot be emphasized enough in these times, times when we have all become “judges” in our own right, times when these next generations will be the change agents, leaders, and policy makers of the world. I would not want me and them to be in a world where there are Six Billion blind men. Rarely do I find myself completely taken in by my surroundings to an extent that I get in a trance like state where all things “me” dissolve and disappear (no, I am not talking about being under the influence of psychedelic drugs). I found myself in this state, on an afternoon on one of the islands of the Galapagos archipelago, an island called Floreana. 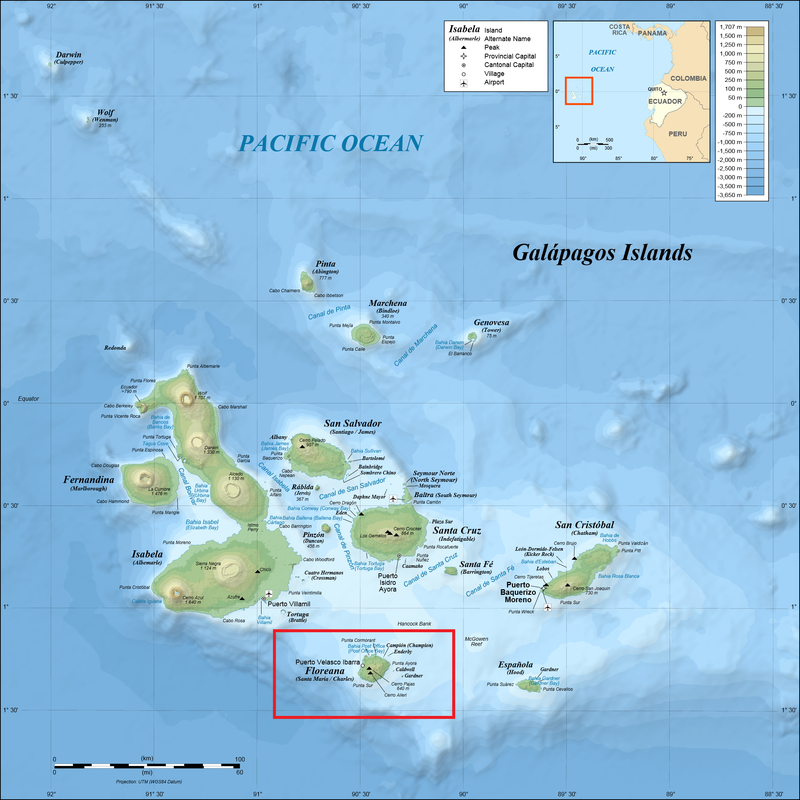 To get some geographic bearings, the Galapagos are a group of islands straddling the Equator in the Pacific Ocean about 600 nautical miles from the coast of Ecuador in South America. These islands are mostly known to the modern man due to Charles Darwin‘s famed voyage of the Beagle and his eventual inspiration for the greatest discoveries of the past century – The Theory of Evolution by means of Natural Selection. 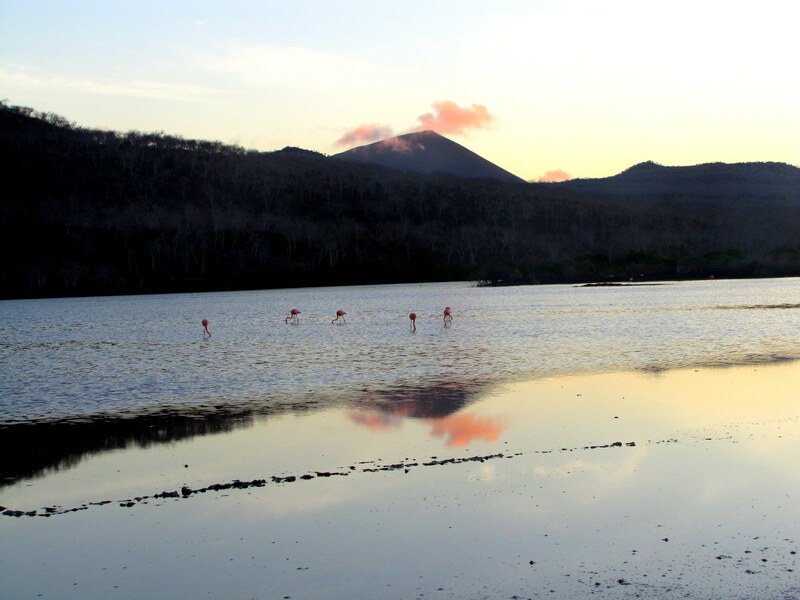 The Galapagos islands are thus, revered in the scientific community as a laboratory of “life” itself. It was November of 2013 and I was with a random group of 15 tourists from around the world on a small ship which was taking us from one island to another. Most of these islands are not inhabited by humans and are preserved with great diligence by the National Park Services managed by the Republic of Ecuador. As a result, save for the islands where there is civilization, the rest of them are untouched and lack any facilities that we take for granted that come by default with civilized settlements. Floreana falls in this category. It was late afternoon, and we made a wet-landing (the actual boat/ship is anchored near the shore and people are ferried to the shore on a small motorized raft called ‘Panga’, since the islands have no facilities for harboring large boats) on the northern shore of the island called ‘Punta Cormorant’. 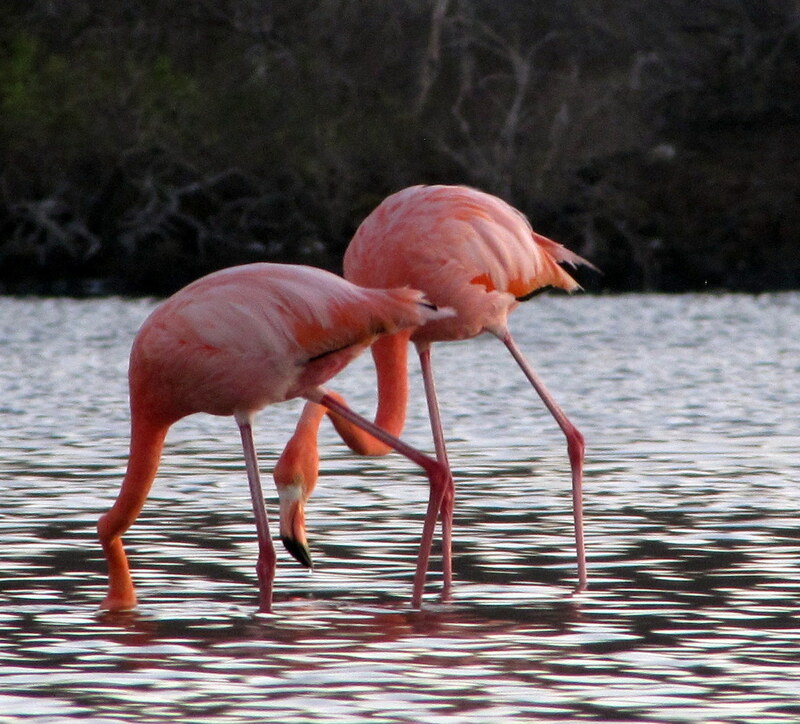 As we waddled in the waters of the Pacific and walked to the dry land, we encountered a number of endemic species that are common to these islands. This was my third day on the trip and the presence of the wildlife had become the new normal, I had started to expect them to be around. It was about 4 PM and the Sun was still fairly high in the sky. 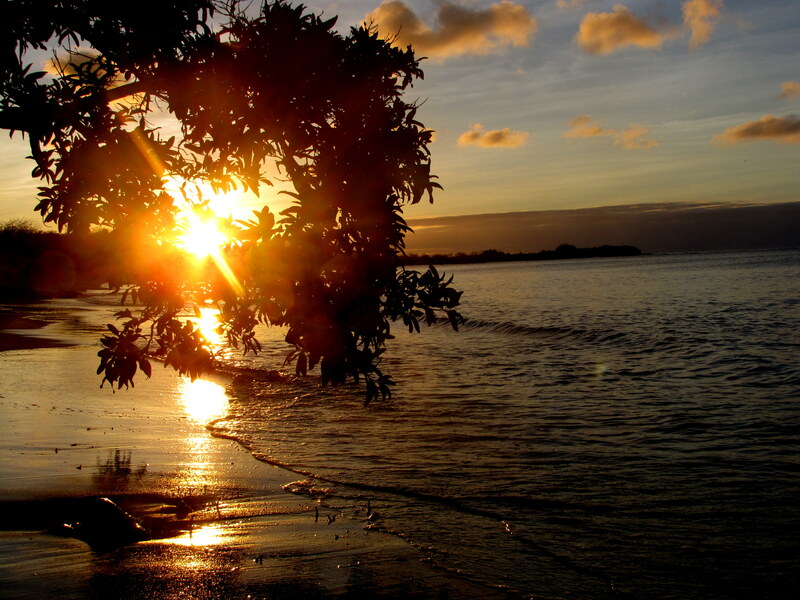 It’s rays shining off brilliantly from the gentle waves of the ocean. We walked past the beach and ventured inland. The marked trail that we were walking on was surrounded by plants which were unique to these islands, plants which had adapted to trap as much moisture as they can during the dry season. There was a gentle breeze which combined with the warmth of the Equatorial Sun was making me feel a bit intoxicated. My reverie was broken when our naturalist, JV, started narrating a story of some strange people who had made Floreana their home in the late 1920s. Dr Fredrich Ritter, a German doctor and one of his patients, Dore, decided to leave their lives in Germany and begin a new life on Floreana. They had occasional visitors who were drawn by a sense of adventure, but then left rather quickly due to the harsh living conditions of these islands. In the early 1930s, a certain Mr Wittmer arrived on the island with his wife and a teenage son. They set up their own place on the island and lived there with little to no contact with the Ritters. This peaceful co-existence was disturbed when a mysterious woman from Austria, who declared herself as a Baroness arrived on Floreana. She was accompanied by her two German lovers and an Ecuadorean lover. The Baroness led a flamboyant lifestyle and anointed herself as the Queen of Floreana. The legend goes that the two lovers had a spat and there was also a feud between the Baroness and the Wittmers. The Wittmer had a pet donkey which was found dead, shot allegedly by one of the Baroness’ lovers. Then mysteriously the Baroness and one of her lovers disappeared from the island, never to be heard from again. The Wittmers claimed that they had left on a boat for Tahiti. There were accusations by Dr Ritter, that the Wittmers with the help of the second lover of the Baroness, murdered the Baroness and her other lover and disposed off their bodies. The strangeness continued, a few months later, Dr Ritter was found dead from apparently eating a sick chicken. This was also considered strange since, the Doctor was known to be a devout vegetarian. Mr Wittmer’s wife, Margaret who died in 2000 and did not shed much light until her dying day on the mysterious disappearances and deaths. She continued to claim that the Baroness had left for Tahiti. The descendants of the Wittmers and Ritters still live on the island. These events were the subject of a documentary called “The Galapagos Affair”. As JV was narrating these events, I started to view the place in a different light. I started to imagine the lives of these people as they lived on this spectacular and yet inhospitable place. Far from the civilized world, far from any hints of societal rules and dogmas. I imagined living in a place like Floreana, and strangely enough I found myself quite “OK” with that idea. With a smile, I brushed these thoughts away. We continued to walk and arrived at a small beach which is known as the “green beach” due to its green tinted sand crystals. As I descended on the beach and the scenery unfolded in front of me, it was a sight like no other. The water was crystalline blue and the sand a strange shade of green. There were sea lions sleeping on the beach as the gentle waves washed ashore around them. We had walked all the way to the Southern end of the island and the Sun was behind us. The fluffy white clouds were catching the late evening Sun and were glowing all kinds of orange and pink. I stood still, I had never been in a place of such absolute isolation and such singular beauty, where every single element entirely belonged within itself while being connected harmoniously with every other element. I felt I was an uninvited visitor, I felt like I was a massive disturbance. I made my way to the water, while standing in ankle-deep water I let the lapping water take away the feelings of being an alien. I started to feel less and less aware of myself. We wanted to go back to the Southern shore before the Sun set, and decided to walk back. After about a 20 minutes walk, we came across a small fresh water lake. 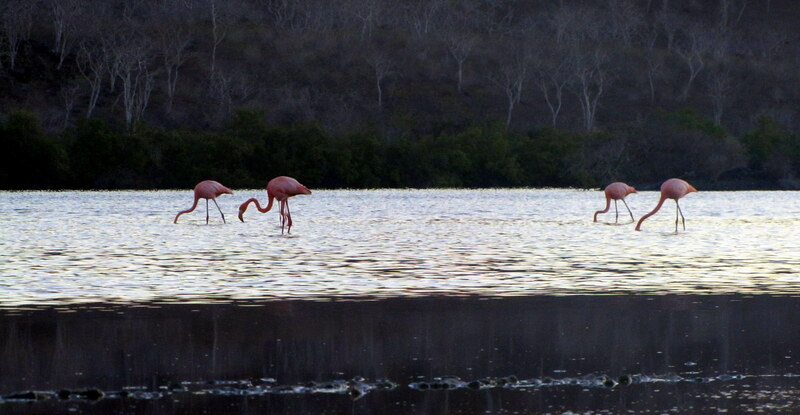 It was late in the evening now, and JV said that this lake at this time is usually visited by pink flamingos. 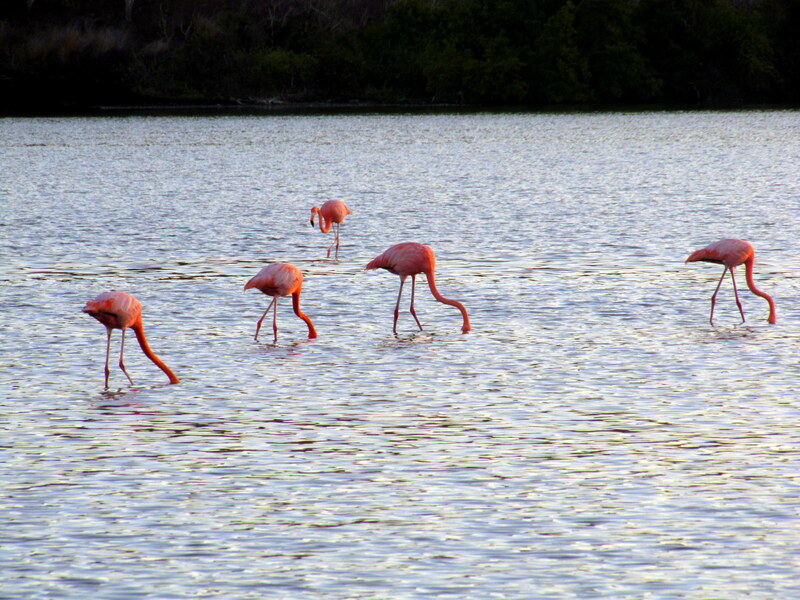 At a distance we did see a flock of flamingos feeding themselves by dipping their unique beaks in the waters of the lake. There was nothing to do but stand still and try to be as invisible as possible, and observe them. As the Sun started its rapid descent into the Ocean, we walked back to the beach where we had landed. Just as we were emerging from the trees, the Sun had touched the water. There were a few mangrove trees dipping their branches and roots into the ocean and under one of these branches a few sea-lions were napping quite contentedly (these sea lions, they don’t do much, than swim and nap – a fine lifestyle if you ask me). I made my way away from the rest of the folks in our group and stepped into the water. The water had taken in all the gold the setting Sun was throwing at it. I had never felt so inconsequential, so “island of my own” before – I, on an island, on a planet which is an island, looking at a Star which is an island in itself – all of us islands drifting, constantly drifting. There were no thoughts in my usually chaotic mind (those who know me, know that this thoughtlessness is an exceptional rarity), there was no purpose to my standing there, to my breathing in and out, to my being! 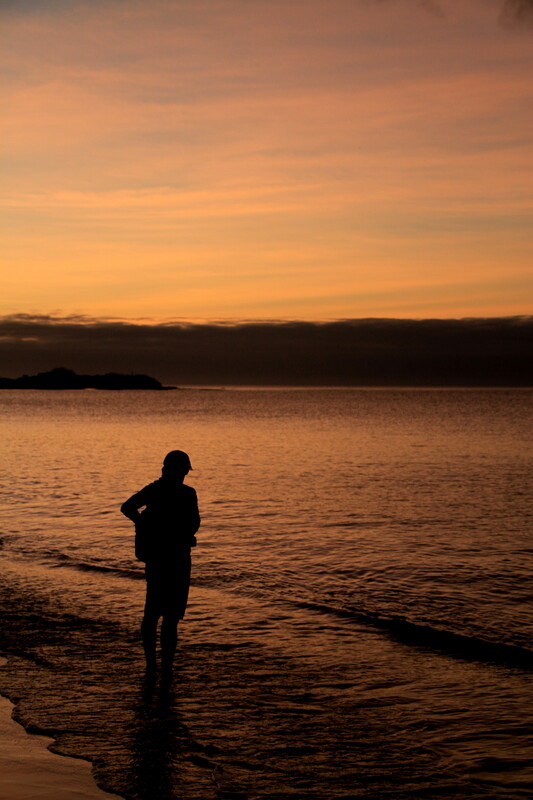 I had no idea that another friend I made on the trip (JB), was quietly taking pictures of my silhouette, while I stood there for a long time. I think her pictures quite beautifully captured the state of my being and my mind (thanks JB). I was a mere dark outline which had blended into the island, an island which has stood there for millions of years. I was a mere blip (if that) in the celestial certainties of this planet and its universe. I have come to believe that travel makes me know myself a little more, it helps me understand what I am, and what I have. This was never more truer, than that day on Floreana. I found a bit of myself that evening. A few months back, I was having a conversation with a good friend about what brings each of us “true” happiness. I can very assuredly say, that what brings me true happiness is when I find myself in a place where I do not have to make any effort to feel one with the place – when the place becomes me and I it. That happened on Floreana, and I will be ever grateful for having experienced it.